Mozambique, formerly Portuguese East Africa, is located in East Africa, just across from the island of Madagascar. Mozambique is bordered by South Africa (south); Zimbabwe, Swaziland, and South Africa (west); Tanzania (north); Malawi and Zambia (northwest); and the Indian Ocean (east). Its capital is Maputo, which was called Lourenco Marques during the days of Portuguese colonial rule. In 2002 Mozambique's population was almost 20 million people. It is expected to reach 33.3 by 2025 and soar to 47.8 million by 2050. More than 96 percent of the population is made up of black Africans, with smaller groups of Portuguese, Asians, and mulattos (mixed racial descent). Although Portuguese is the official language, there are also many African languages spoken throughout the country. The Portuguese started coming to East Africa in the sixteenth century. By the next century, the Portuguese were competing with Arabs for trade in gold, slaves, and ivory. Despite strong African resistance, Portuguese colonials slowly extended their control from the coast toward the interior where many of the indigenous people lived. By the end of the nineteenth century, when Europe held its "Scramble for Africa," what is now Mozambique was ceded to Portuguese control. Although in some of the British-controlled colonies in Africa it was expected that indigenous Africans would ultimately get a chance to run their own affairs, there were no such illusions by the Portuguese, who regarded their colonies as permanent "overseas provinces." The Portuguese said that the colonies could send representatives to sit in the Portuguese legislature, and they also followed an "assimilado" policy, which meant that Africans who had the proper education and backgrounds could aspire to be assimilated into Portuguese culture. In other words, they would become Portuguese, instead of Mozambicans. Initially, the Mozambique Company took over control of the country and used its authority to force the Africans to pay taxes and work on plantations, but this ended in 1926 as the Portuguese government decided to reassert itself. By 1951 Portugal had transformed Mozambique into an overseas province, as distinct from a colony. As other European colonies in Africa and Asia achieved independence, Mozambique's Africans began to organize to resist Portuguese rule. These efforts eventually resulted in various black groups coming together, on June 25, 1962, to form the Mozambique Liberation Front (FRELIMO). In September 1964, FRELIMO launched guerrilla warfare against the Portuguese, who responded by sending in reinforcements to try and contain the spreading conflict. Soon after that, the new Portuguese government initiated negotiations with FRELIMO and also with other guerrilla groups in Angola and Portuguese Guinea. The talks, in neighboring Lusaka, Zambia, between FRELIMO and Portuguese representatives resulted in Mozambican gaining its independence from Portugal at midnight on June 24, 1975. The FRELIMO party, during its liberation days and its headquarters in neighboring Tanzania, had developed strong ties with the Soviet Union, which had armed and trained some of its guerrillas. At independence, Mozambique continued its close ties with the Soviet Union and took some steps to implement socialism. FRELIMO regarded itself as a vanguard movement, similar to the communist parties of the Soviet Union, Cuba, China and Eastern European countries, whose mission was to transform society. Under the revised November 1990 constitution, Mozambique became a parliamentary multiparty democracy. Mozambique's history of struggle helped shape the media system that the country inherited from its Portuguese colonial masters. Portuguese is the Mozambique's official language. Other languages are Makua-Lomwe, Tsonga, Shona, and Swahili. Life expectancy is 47 years for men and 50 for women, although this is likely to drop as the HIV/AIDS epidemic continues to ravage the country. Literacy is low; an estimated two-thirds of the population is illiterate. In 2002 education was compulsory for those aged 7 to 14. Under Portuguese rule, educational opportunities for blacks were almost non-existent; only a few of the elite got a chance to study in Portugal. As of 1997, there were 1.74 million children in 5,689 pre-primary school institutions; 1.89 million children in 6,025 primary schools; 51,554 students in 75 high schools; 12,001 students in 25 technical institutions; and 7,156 students in 3 colleges/universities. The road for the media in Mozambique has been a rocky one. Under Portuguese rule, there were no independent media outlets. Illiteracy was so high among the Africans that indigenous newspapers were not feasible. The first newspaper in Mozambique was the Lourenco Marques Guardian , which started publishing in 1905. It was published in the country's capital city, and its target audience was the British community within the city. The Roman Catholic Church acquired the Guardian in 1956, changed its name to Diario , and began publishing it biweekly in English and Portuguese. After continuing policy conflicts between the archbishop of Lourenco Marques and the more liberal bishop in Beira, Noticias da Beira became the country's second newspaper in 1918. Noticias da Beira was a biweekly newspaper, also published in English and Portuguese. Fourteen years later, in 1932, the bishop was supported in the launching of A Vox Africana , by local Africans. In 1950 the bishop was at it again, this time with the launch of Diario de Mocambique , a daily Beira newspaper. His move was matched by the Lourenco Marques archbishop who turned Diario into a daily newspaper. Another newspaper appeared in 1926, started by a retired Portuguese military officer. It was called Noticias and was a Portuguese language publication based in Lourenco Marques. Noticias became the country's official Portuguese newspaper. In 1975 the FRELIMO government took over Noticias , which became a government-controlled publication. Noticias da Beira remained the country's second newspaper, but all other daily newspapers disappeared as the country embarked on its Marxist-Leninist path under Machel. Agencia de Informacao de Mocambique (AIM) is the country's domestic news agency, a government-run institution charged with collecting and distributing news about Mozambique and cooperating with other news agencies, including the Pan African News Agency. Reuters, Novosti, and German, Italian, and Portuguese news organizations have also been allowed to operate in Mozambique. The 1990 constitution opened up the political process to competition, but it also gave the media more freedom from government control and interference. Mozambique has moved away from its post-independence rigid Marxist-Leninist tendencies, where the media was seen as nothing more than a propaganda organ. State-controlled Radio Mozambique remains the country's main source of news and information. Private and commercial radio stations are also allowed to operate, unlike in neighboring Zimbabwe. An estimated 40 community radio and television stations, supported by UNESCO and the government, exist around the country. Parts of the country also get BBC World Service and RTP, the Portuguese television's African service. In 1995 there were 660,000 radio receivers; by 1997 this had increased to 730,000. During the same period, the number of television receivers went from 60,000 to 90,000. The number of listeners and viewers is much higher because radios and televisions are shared among family members, friends, neighbors, and communities, with a resultant multiplier effect in total audiences. The new constitution protects freedom of the media and has resulted in a number of radio stations, including those linked to the RENA-MO opposition group, the Roman Catholic Church, and even one that is youth-oriented. Circulation of the print media is limited because of the high illiteracy levels in the country. However, in 1995 it was estimated that there were three daily newspapers with a circulation of 130,000. By 1996 the number of daily papers had dropped to two, and the circulation had plummeted. The major newspapers are Diario de Mozambique ( Mozambique Daily ), established in 1981 and published in Beira; Demos Portuguese , published in Maputo; Noticias ( News ), established in 1926 and published in Maputo; Savana , a Portuguese weekly that was established in 1994 and published in Maputo; and Domingo , another Portuguese weekly that was established in 1981 and published in Maputo. Other newspapers include O'Popular , a privately owned daily, and Fim de Semana, a privately owned weekly tabloid. The only newspaper with a circulation in the 25,000 to 50,000 range is the Portuguese language Noticias , which is also the country's largest newspaper. Diario de Mozambique , the country's other daily, falls in the 10,000 to 25,000 circulation category. These two are also the most influential newspapers in the country. There are four non-daily newspapers, with an estimated total circulation of 160,000. Although Mozambique averages 55 inches of rainfall per year, it usually imports food. Its agricultural products include shrimp, fish, tea, sisal, coconuts, corn, millet, cassava, and peanuts. Tantalite, gold, iron ore, titanium, oil, and natural gas are among some of the minerals found in Mozambique. Although Mozambique was still desperately poor in 2002, with an average annual income of U.S. $210, the economy was improving, unemployment was dropping, and there was positive economic growth over the past few years. There is no overt censorship in Mozambique, but there is a certain level of self-censorship. The new Mozambique constitution protects press freedom, which has allowed Mozambican journalists to write stories critical of the government, without fear of victimization. Journalists have also been critical of official corruption and mismanagement. Although the media is free to write, publish, and broadcast what they want, they face criminal libel laws, which may have a chilling effect on their ability to gather and disseminate news and information. The private sector has not been spared from scrutiny. A crusading editor was, however, killed, and there was widespread speculation that his assassination was because of the dirt he had uncovered on certain people in public life. The government owns Noticias and also runs Agencia Informacao Mocambique (AIM), the country's domestic news agency. In the past, only Cuban, communist, and African journalists and news agencies were welcome. At that time, Mozambique espoused a Marxist-Leninist philosophy, which regarded the media as appendages of the ruling party, whose role was to propagate the policies and philosophies of FRELIMO. Western journalists and media were not welcome. Western journalists and media now are welcome in Mozambique. Portuguese newspapers and magazines are now available. Portuguese journalists and others from the Western countries operate freely. Although the opposition complains that it does not get enough coverage in the media, that claim is less valid in the 2000s than in the past. Even the government media gives coverage to the opposition party. There is a great need to recruit and train talented journalists. The British and Canadians have provided some training and skills courses for Mozambican media personnel. There have also been short courses and seminars held in Mozambique, Zimbabwe, Zambia, Namibia, and South Africa, which have given the Mozambicans some hands-on training, as well as opportunities to meet and work with fellow Southern African media practitioners. But, the need for media personnel in Mozambique is great. Mozambique's political process was opened up to multi-party competition and a new constitution guaranteed press freedom and opened up the country to multiple voices. The future of the media is much brighter in Mozambique in 2002 than it was 15 years ago. Mozambique seems to have adopted many democratic trappings, including acceptance of the often adversarial relationship between the government and the media. Media workers operate in an environment where the government has become less intrusive and less threatening. Improved opportunities in education, an economy that is improving, and the availability of more consumer goods to more people are among other factors making Mozambicans more optimistic about their future. Africa , 7th edition. Worldmark Press Ltd., 1988. British Broadcasting Corporation. Country Profile: Mozambique , 2002. Merrill, John C., ed. Global Journalism: Survey of International Communication , second edition. New York: Longman, 1993. "Newspapers of Africa." International Editor and Publisher Yearbook , 2002. World Almanac and Book of Facts 2002 . PRIMEDIA Reference Inc., 2002.
hey, this is info on mozambique and everything that i need for the esaay, do read it and get back to me. Listen on any HF radio on 7076 Khz LSB to the Mozambique Border Police? Inside the amateur radio band. Follow all the stuff they illegally doing . VERY interesting and they think its private. - I loved reading this! There is such a need for the gepsol to be contextualized into the culture It isn't so easy to do though! My heart is blessed to hear how this group has learned to do that! Keep encouraging all these people you meet! May the Lord continue to bless your encounters! how l wish 2 work 4 such a country that guarantees media freedom,l have a degree in Media and Society studies so how do l obtain a job in your country,what procedures am l 2 follow? It is good to hear about media freedom and all about communication in that country. I hold a diploma in advanced journalism and certificates in advanced radio production skills, journalism and studio techniques, language and communications and computer studies. I am also a graphic designer, and I am experienced in producing and presenting radio and television programs, sound engineering, using digital equipment, public relations. I hope that your Internet and radio station places are correct. I am doing a essay on Mozambique, and if this information is incorrect, it would be a pity if I got a low grade on this essay. P.S. Generic Guy is NOT my real name. 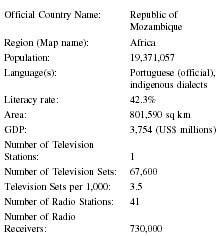 I'm interested with the Mozambique Broadcasting Industry. Which institution have Broadcasting regulation in charge.